There are very many wonderful illustrated books from Venice in our collections; far more than we have space to exhibit. Over the next few weeks we will be posting about the ones we have included, and some that we couldn’t fit in. On 16th April Laura will be giving a talk in CRC. We plan to get out everything we have blogged about for that. “The art of memory” survives in the modern world mostly in the form of self-help books and motivational training courses, but it actually has a long and distinguished history, back to classical antiquity. Classical lawyers and politicians, needing to be able to make lengthy, formally-structured speeches from memory, used the techniques of artifical memory. In their imagination they would turn each of the points of their speech into a strong visual image, and then arrange the images in order within a structure they could easily remember. Typically this would be a building, either real and familiar, or created in the imagination for the purpose. 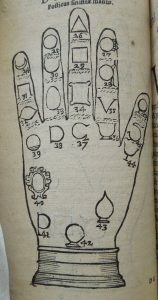 These techniques remained in common use well into the seventeenth century. In a culture where public affairs were still largely conducted orally, the ability to speak fluently, persuasively and at length, in public, was vital to a professional career. As well as being useful to lawyers and politicians, artificial memory techniques were useful to students, whose academic exercises and examinations were largely based around oral disputations. The techniques were popular with the Friars, whose lives were dedicated to preaching and teaching religious knowledge, and who had to be able to explain complex doctrine accurately. The technique of artificial memory was passed down from Classical antiquity through three texts – Cicero’s De Oratore, an anonymous handbook Ad C. Herennium, and Quintilian’s Institutio Oratoria. In the Middle Ages it was refined, improved and expanded on. 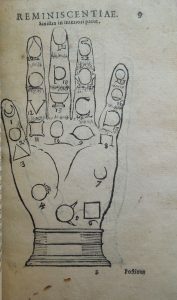 This continued into the Renaissance, where artificial memory was often elaborated to the point that it became an intellectual game, rather than a practical technique. The Renaissance had a fascination for imagery, symbolism, emblems and hidden meanings, and keen interest in imposing a structure on knowledge. The symbolism of artificial memory very easily plays to all of these, and elaborate symbolism and word games can easily be incorporated into it. In some Renaissance examples of artificial memory it is difficult to tell which is the material to be memorised and which is the structure supposed to hold it. This little handbook was written within this late tradition. Instead of using locations in a building as the places to lodge the memories, it uses both sides of both hands to create 92 places, each marked with a symbol – which had itself to be memorised before it could be used as a tool to remember anything else. 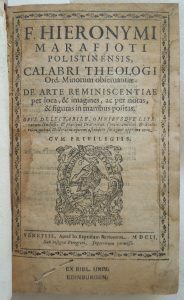 Many of the illustrated books which have been included in the project Venetian Renaissance prints, drawings and illustrated books in Scottish collections are high-quality, luxury productions. This little book was produced with quite different ambitions. It was intended for a relatively popular market – it was reprinted several times, including in an Italian translation – and the illustrations are entirely practical and very necessary to explain the text. It is not clear how this copy reached Edinburgh, but in the late eighteenth and early nineteenth centuries it passed through the hands of two bibliophiles, or bibliomaniacs. 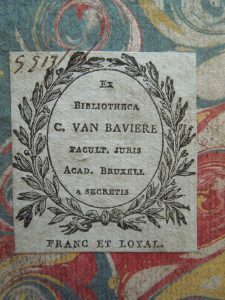 First came Charles-Louis Van Bavière, (1767-1815), Secretary of the Academy and Faculty of Law, Brussels. His professional life seems not to have preoccupied him much: he was a dedicated bibliophile with a reputation for having an eye for a bargain, and for finding unlikely treasures in improbable-looking sales. After his death, his huge library was sold at auction over 22 days, in Brussels in 1817. 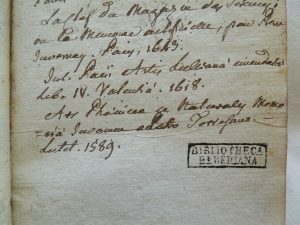 This sort of sale undoubtedly appealed to the book’s next owner, the antiquarian and legendary bibliomaniac Richard Heber (1773 – 1833), whose vast library, collected all over Europe, and housed in half a dozen separate locations, was sold after his death in a series of sixteen sales, in England, France and Belgium, realizing the then enormous sum of more than £60,000. Books from both these scattered collections are in wide circulation today, readily identifiable from their owner’s bookplates and ink stamp. This entry was posted in Uncategorized by elawrence. Bookmark the permalink.